The kits, designed to be kept in the workplace, contain two doses of Narcan nasal spray, a surgical mask and gloves, and instructions on administering Narcan. BOSTON, Oct. 4, 2018 /PRNewswire/ -- Seventy percent of Massachusetts residents believe the opioid-reversal drug commonly known as Narcan should be widely available in workplaces, similar to automated external defibrillators (AEDs). The finding is part of a new opinion poll just released by Blue Cross Blue Shield of Massachusetts ("Blue Cross"). The poll was conducted in September 2018 by Anderson-Robbins Research and comprises a representative sample of Massachusetts residents. In conjunction with this finding, Blue Cross today becomes the first health plan in the state to provide opioid toolkits for employer customers. 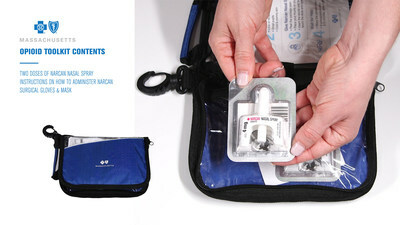 The kits, designed to be kept in the workplace, contain two doses of Narcan nasal spray, a surgical mask and gloves, and instructions on administering Narcan. Along with the kits, Blue Cross will provide onsite employee education and Narcan training, and an online opioid resource center, with information on family support, medication safety, pain management and opioid use disorder treatment care options, including information on how to access medication-assisted treatment. "The opioid crisis has grown to be one of the most devastating public health epidemics we've faced as a nation," said Andrew Dreyfus, president & CEO at Blue Cross. "So Blue Cross is teaming up with employers as part of our response to the crisis. We're providing them with the resources they need to reverse overdoses and educate their employees, whether in an office setting, a job site or a city hall." Four Blue Cross customers are participating in a pilot program to test the effectiveness of the toolkits, training, and online resource center. They include Shawmut Construction, New England Regional Council of Carpenters, the city of Brockton, and the town of Ware. Blue Cross is also introducing the toolkits and training into its own workplaces. "We tested the toolkit idea with consumers, half of whom had a personal experience with opioid addiction via family members or friends," said Dr. Ken Duckworth, Blue Cross' medical director for behavioral health. "Their feedback helped inform what we included in the kits and what type of education and information we'll provide along with the supplies. We know there's not a single solution to this epidemic, but this is an important step toward empowering employees to be leaders when it comes to this crisis." "Working in an industry that's the second-most susceptible to opioid abuse, we've created a cross-functional opioid task force to develop educational tools and resources for our employees and partners," said Shaun Carvalho, safety director at Shawmut Design and Construction. "So when Blue Cross approached us about piloting the employer opioid toolkit, we saw it as the perfect opportunity to enhance our efforts, starting at the office level and working with the team to eventually get the toolkits to all of our jobsites." "The city of Brockton has been a leader in the fight against opioid overdose deaths," said Brockton Mayor Bill Carpenter. "We're on the front lines of this public health crisis and we're committed to providing the education and training needed to help stem this epidemic. These toolkits, along with the additional resources Blue Cross is providing, will be an important resource as we continue to raise awareness about prevention and intervention, and equip more members of the community to be able to respond in the event of an overdose." Since 2012, with the introduction of its Prescription Pain Medication Safety Program, Blue Cross has been a leader in Massachusetts and nationwide in helping to stem the opioid epidemic through a variety of innovative efforts focusing on education, prevention, treatment, and recovery. Blue Cross is a founding member of RIZE Massachusetts, which seeks to build a $50 million fund focused on bringing real and lasting change to those struggling with substance use disorders in the Commonwealth. In 2018, Blue Cross made a quarter-million-dollar investment in an innovative, peer-to-peer opioids education program called Drug Story Theater. Additionally, Blue Cross has removed co-pays for Narcan for most of our fully insured plan designs. Anderson-Robbins interviewed 507 Massachusetts adults as part of this poll. Interviews were conducted by trained professionals working from a central, monitored location between the dates of September 5-13, 2018. Telephone numbers were randomly selected using a random digit dial methodology and a probability proportionate to size approach, meaning numbers are proportionally representative to the number of adults in each region of the state. Respondents were contacted on both landlines and cellphones. The overall results have a margin of error of ±4.0%; the margin of error within individual subgroups is higher.